Dungannon driver Kris Meeke moved up three places on the final day of the Rally of Spain to finish in 19th spot. 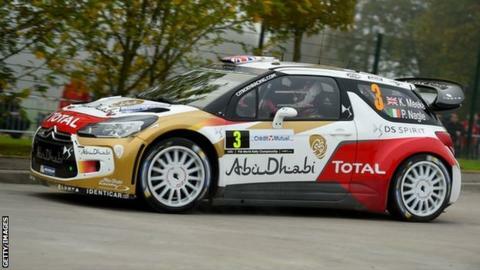 The Citroen DS3 man ended 27 minutes 36 seconds behind winner Sebastien Ogier, who secured his second consecutive world drivers' title. The Frenchman led Finn and Volkswagen team-mate Jari-Matti Latvala by 11.3 seconds to clinch the title with one round of the global series remaining. Meeke remains on 82 points, dropping to seventh behind Norway's Mads Ostberg. Mikko Hirvonen was third in the Spanish round of the championship, held over 17 stages, one minute 42.2 seconds behind Ogier. Meeke's chances of securing a top finish in the penultimate round of the series ended when he suffered a double puncture in one of Friday's stages. He changed the rear right tyre in the stage, but with only one onboard, a deflated front right meant a retirement for the day. He was back at the wheel on Saturday and Sunday, winning one of Saturday's stages. The Northern Ireland competitor finished third in the previous round in France, equalling the other podium finishes he achieved in Monte Carlo, Argentina and Finland earlier in the season. Meeke hopes that his performances this season prove enough for him to retain the Citroen drive for 2015. The final round is the Wales Rally GB, which will be held from 13-16 November.